ADMIRAL JOHN JELLICOE Portrait Signed. British Admiral of the Fleet who commanded at the Battle of Jutland in WW1. 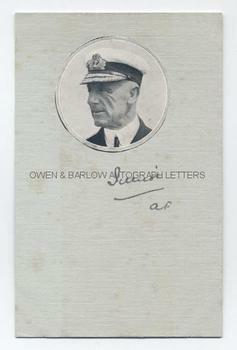 Autograph signature of Admiral Jellicoe, who has signed below a circular offset-litho photographic portrait of himself which has been mounted on a post-card. The card measures approx 5.5 x 3.5 inches. Fine. Admiral Jellicoe commanded the British Fleet at the Battle of Jutland in 1916. This was the only major battle fought on the high seas by the battleships known as "Dreadnoughts". It was indecisive but considered a British victory as the German fleet retired from the engagement. The British, however, lost more ships and Jellicoe endured a certain amount of public hostility for failing to win a victory to compare with Nelson's Trafalgar. He was appointed First Sea Lord in 1916 but dismissed in 1917 for what some saw as his pessimistic outlook on Britain's war prospects and a difference of opinion over the policy to defeat the German U-boats. He was Governor-General of New Zealand from 1920 to 1924.